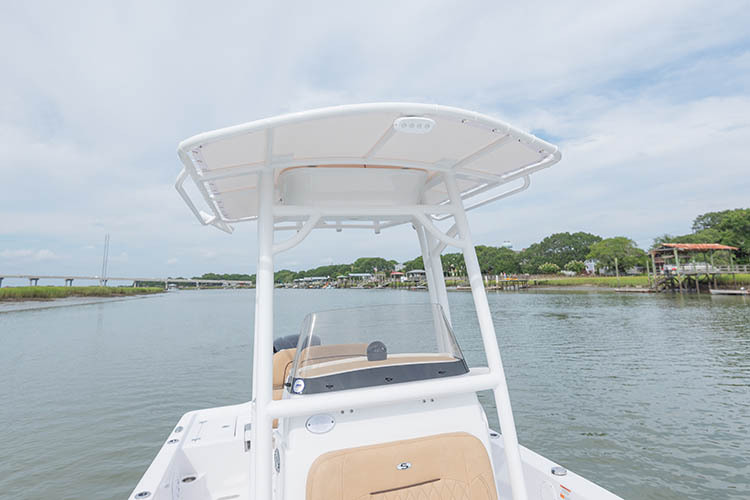 For lower bridge clearance and coverage, the Bimini Top is a great option. 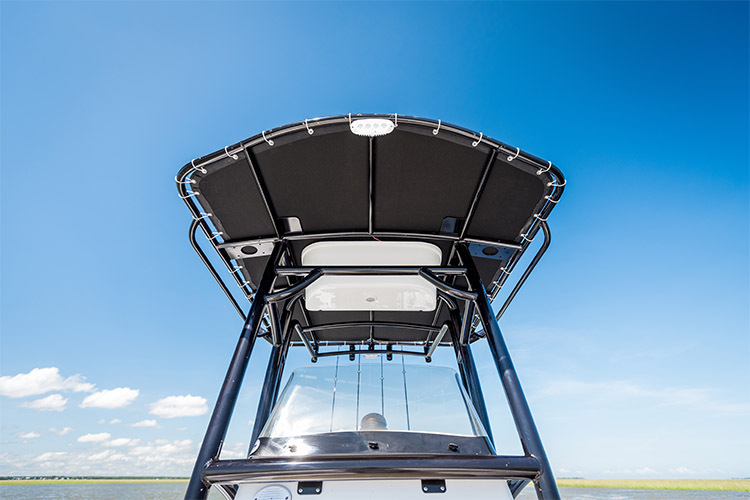 Easily folds away allowing for the lowest level of clearance and when open, casts a wide area of shade. 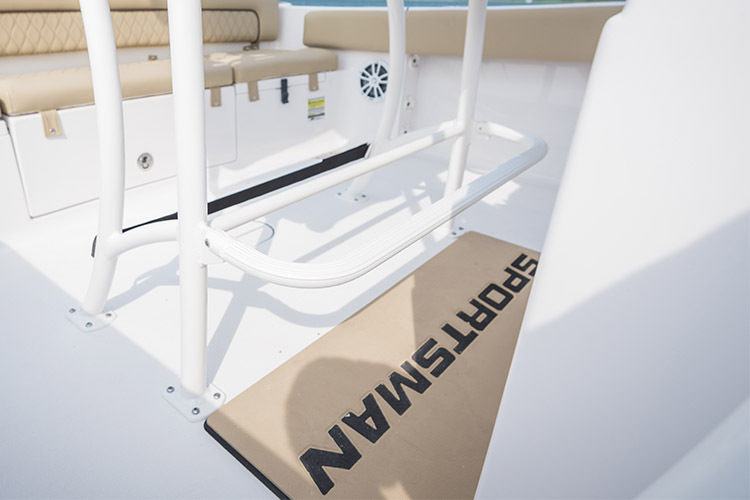 This option adds a single removable large cushion to cover the bow of the boat. 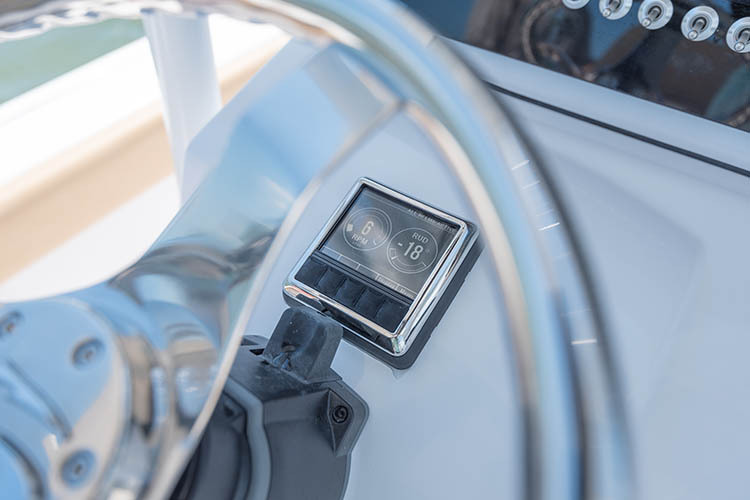 Considered one of the Four Great Inventions, the compass remains the cornerstone of any navigation system despite our advanced digital displays. 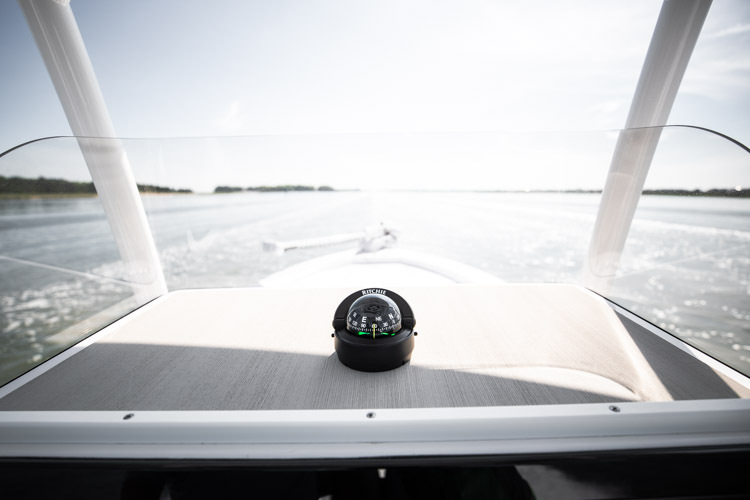 Regardless of condition, your compass provides real-time heading and when used in combination with your GPS data, it allows you to optimize performance, fuel efficiency & improve safety. 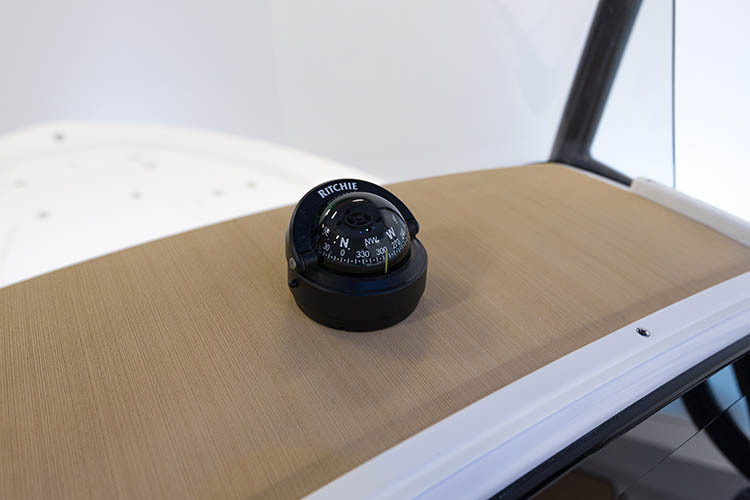 When it gets dark, there's a built-in light inside the compass for night use. 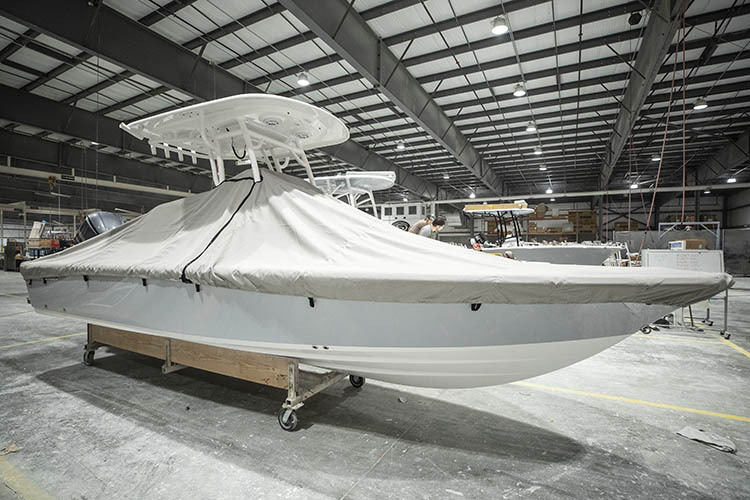 This is the full option for the Black or Steel Blue hull colors. For more information on colors, visit the colors and materials page. 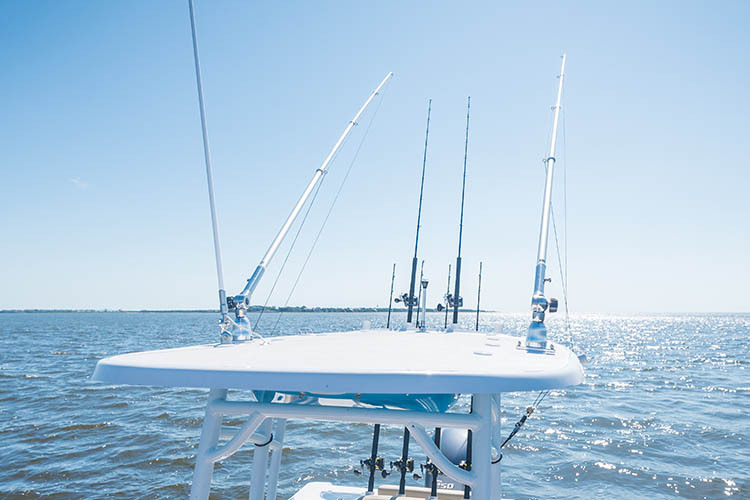 This high quality canvas T-Top offers great shade and comes with an electronics box for storage, 4 rocket launchers, spreader lights, outrigger plates and anchor light. 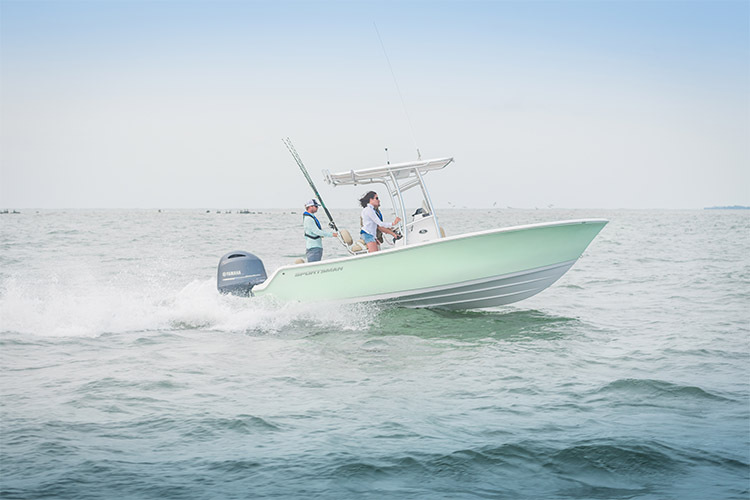 Beautiful fiberglass hard-top packed with features like JL Audio speakers, LED anchor light, map reading light, spreader light, misters, rocket launchers, kingfish rod holders and Taco outrigger plates. 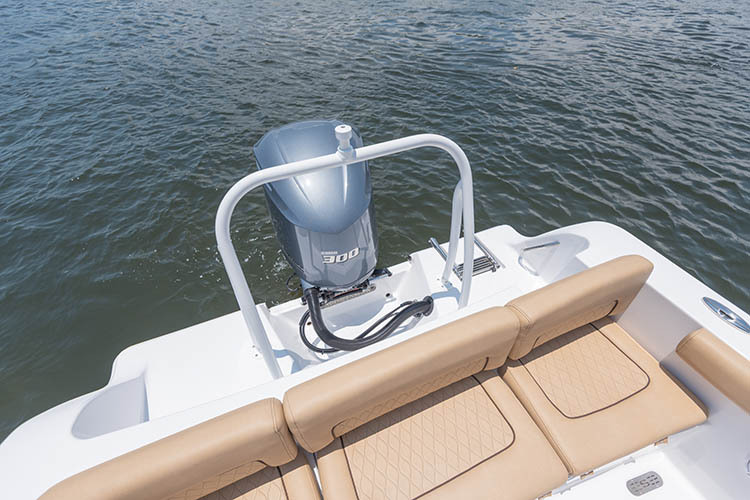 If you select an options package group that includes a Deluxe T-Top, this option will upgrade that top to the fiberglass Hard-Top instead. 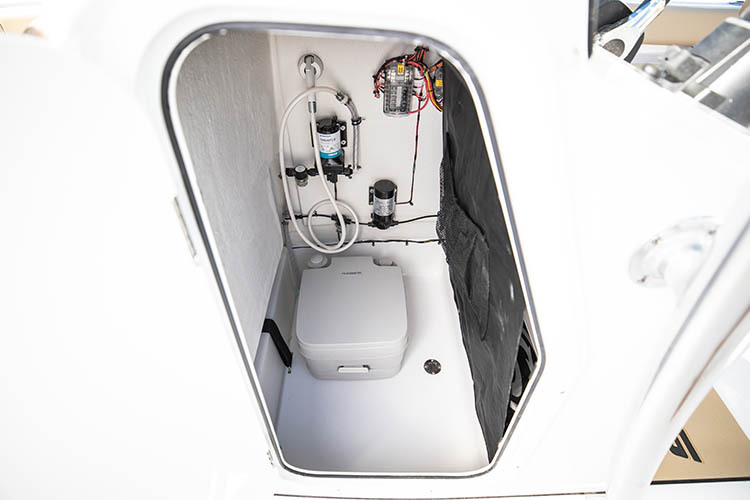 This complete freshwater washdown system with 15-gallon tank is a great convenience after a long day on your boat. 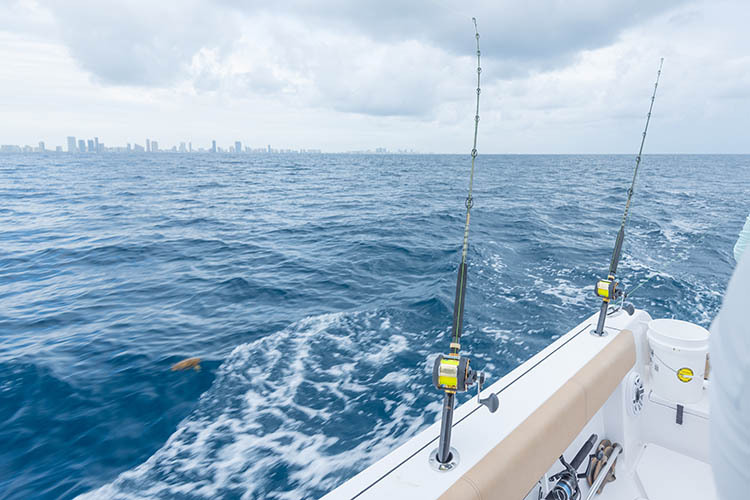 Common uses include hosing down the deck, cleaning up the floor after you reel in a big fish or rinsing off yourself after a day at the sandbar. 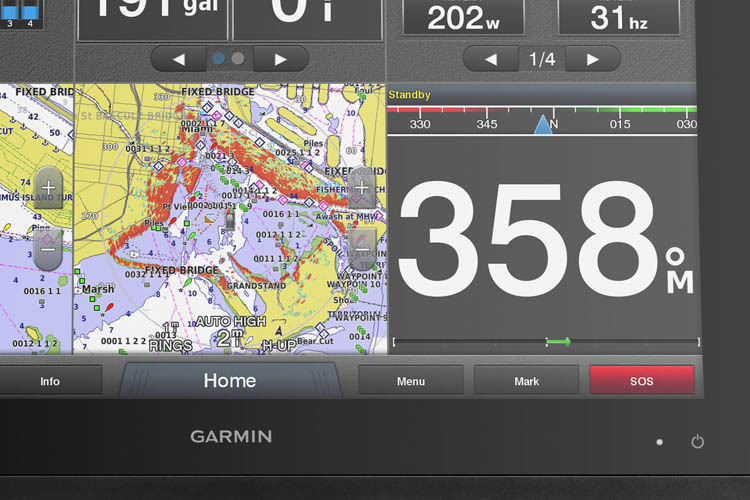 Graphics hull side package for an extra hull side flare. 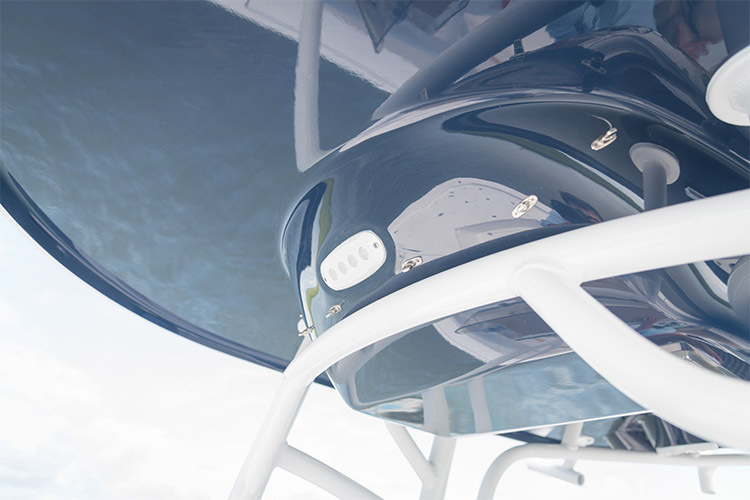 Feel all-day comfort with our custom anti-fatigue helm pads. You will notice a difference at the end of the day, your feet will thank you for it. Custom engraved with the Sportsman logo for that extra touch. 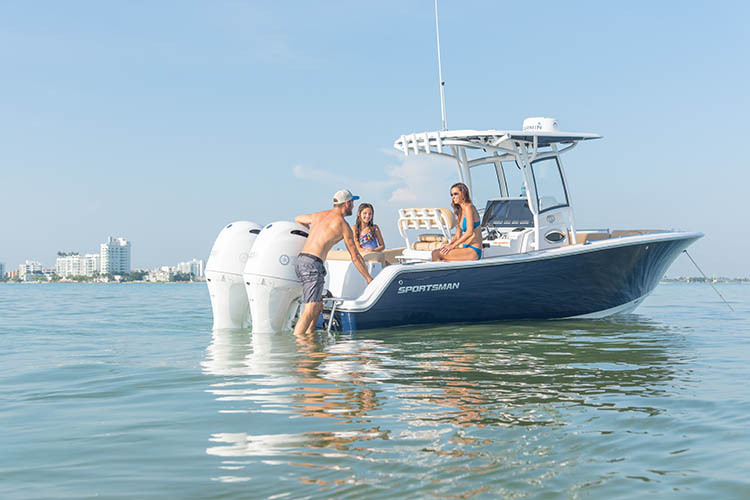 This popular option adds a full size custom Sportsman ICON 75 cooler with track that easily slides out even when fully loaded and includes a custom pad on top. If you already own a cooler and would like to just get the slide mechanism only, this option adds the track but does not come with a cooler. 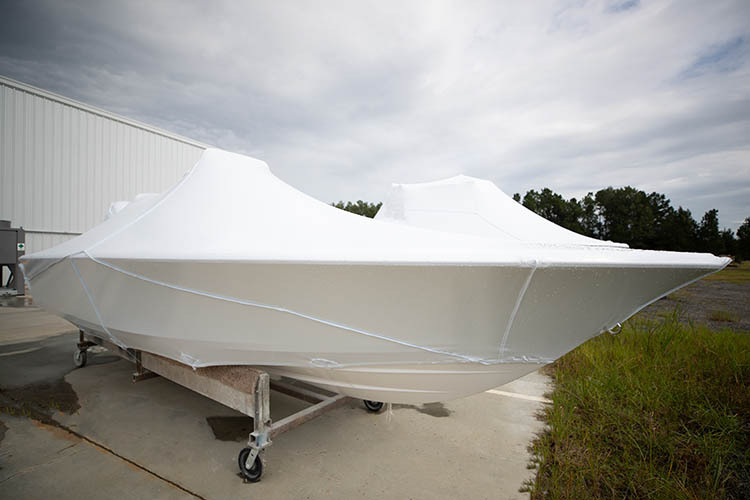 This model comes standard with a white hull. 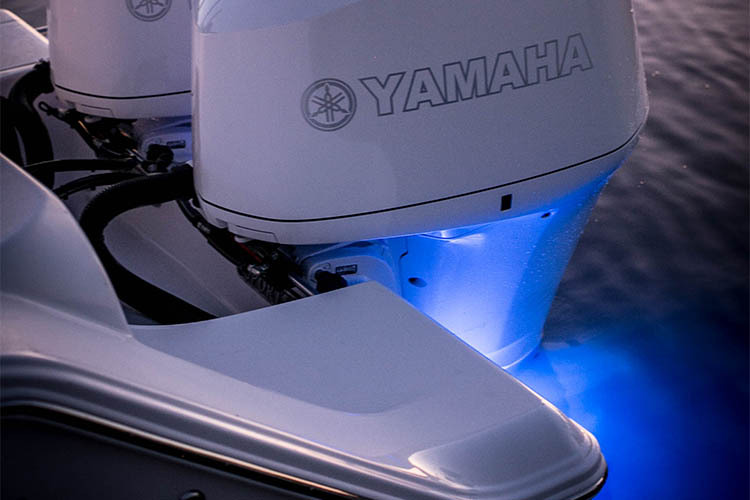 To add any of the light hull colors, you must choose this option. For more information on colors, visit the colors and materials page. 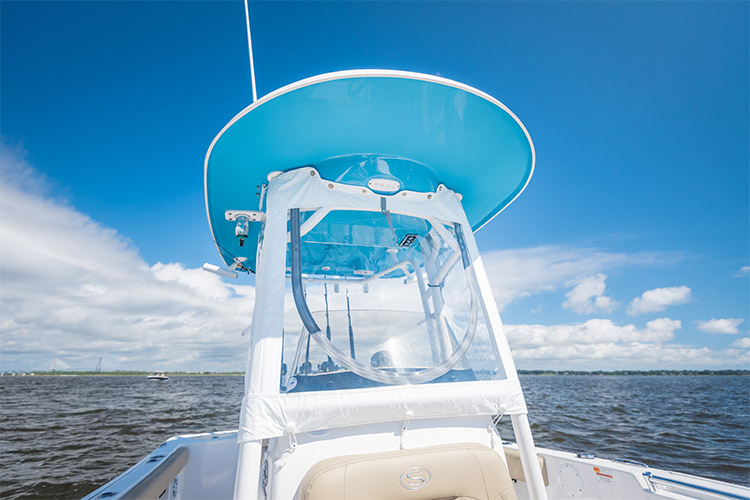 A popular trend is to have the underside of the hard-top matched to the hull color, this adds additional appeal and ties in the color theme of the boat sides by bringing additional color to the cockpit area. 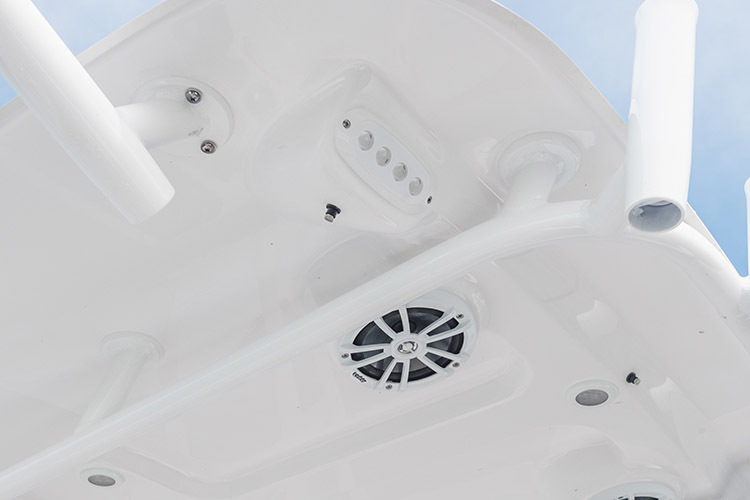 When the boat is equipped with the Hard-Top and Freshwater option, the misters can be added. 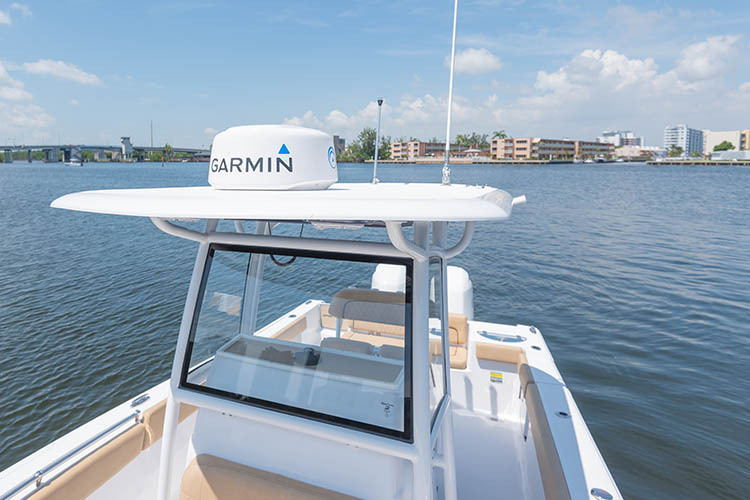 This misting systems draws water from the fresh water tank and mists it down from nozzles on the hard-top. 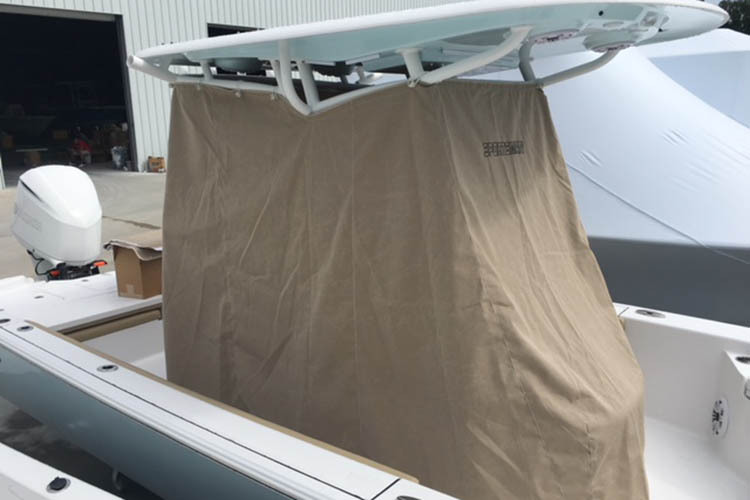 Full boat cover to protect your boat from the weather and debris. 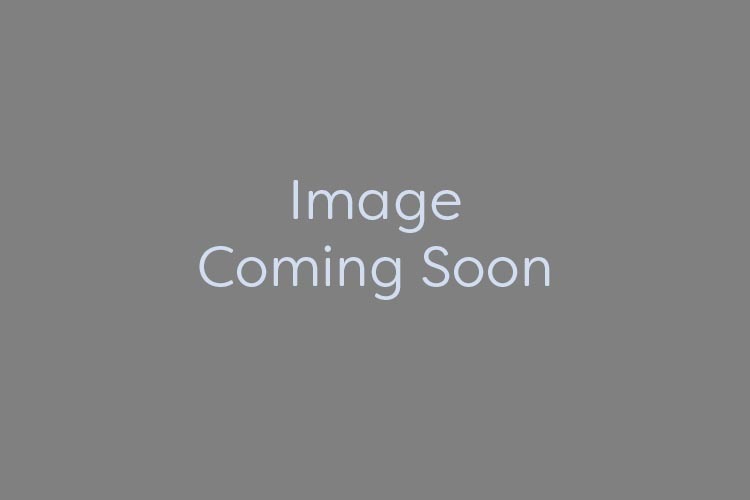 Image shown may not show the exact model, for reference only. 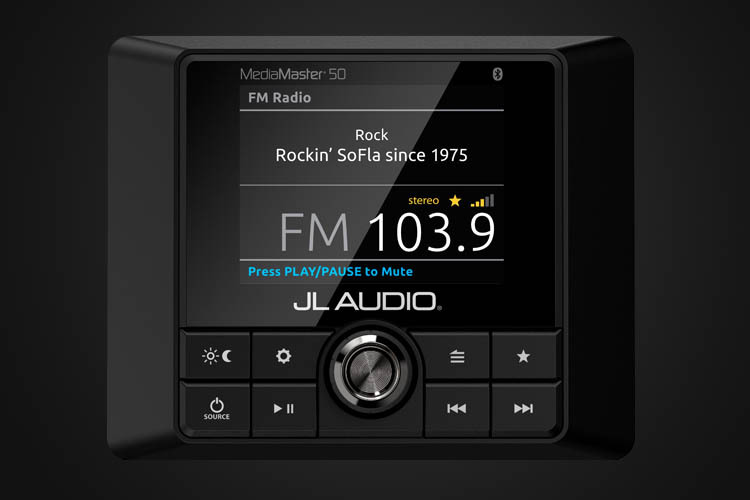 This all-in-one system, has 2 separate compartments built in. 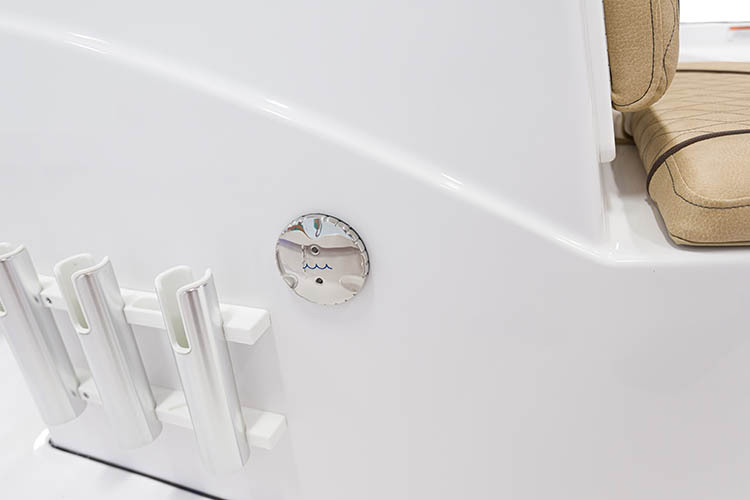 The bottom most compartment contains freshwater for cleaning the bowl and the middle compartment holds any waste. 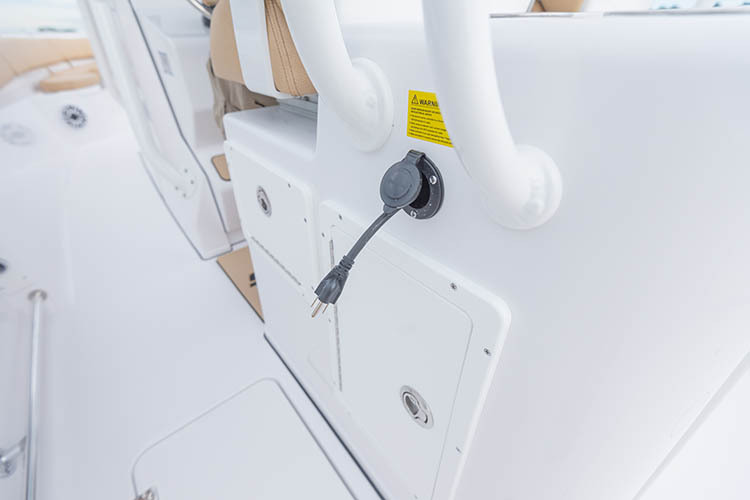 It gets installed inside the head compartment with 2 brackets that secure it in place but comes apart easily for cleaning. 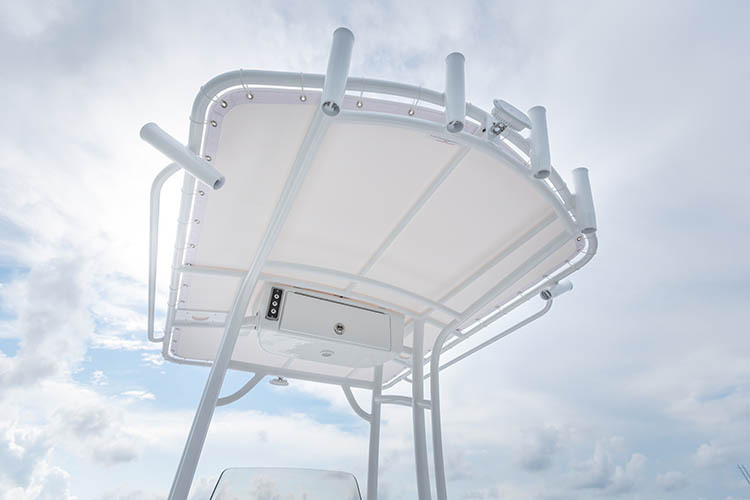 Adds the same protective coating to the Top frame and Leaning Post option. 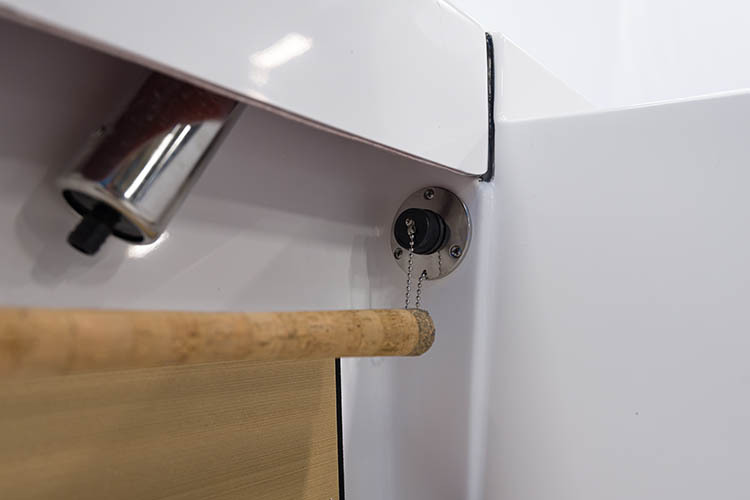 Adds the same protective coating to the Leaning Post option. 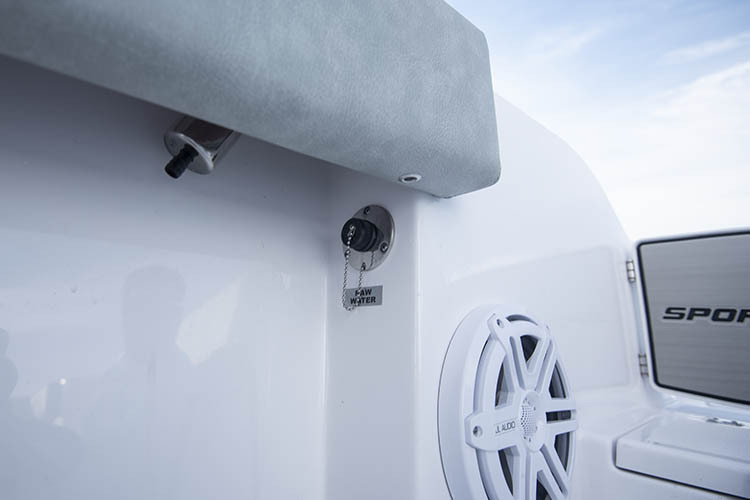 SeaStar jack plate made of anodized aluminum for durability. 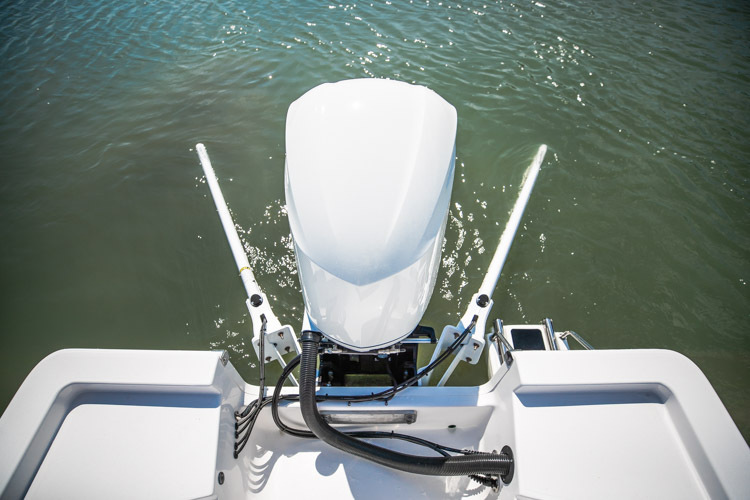 It will provide you with higher speed, gains in fuel economy and the ability to run in shallow water. 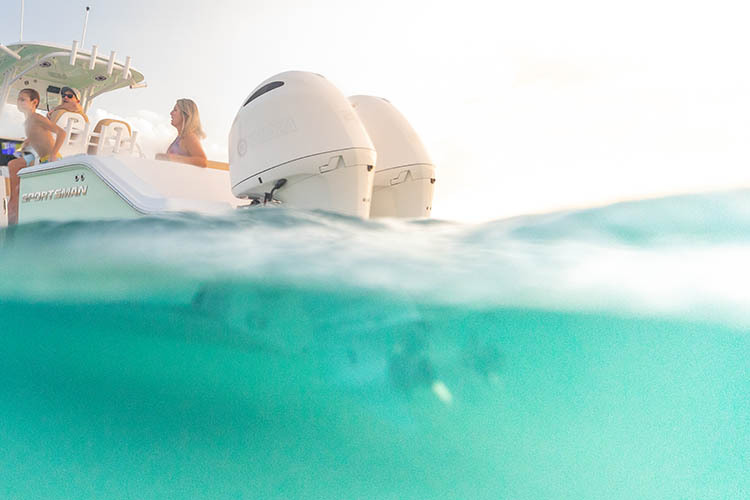 The spray shield provides additional protection for those behind the helm from any spray. 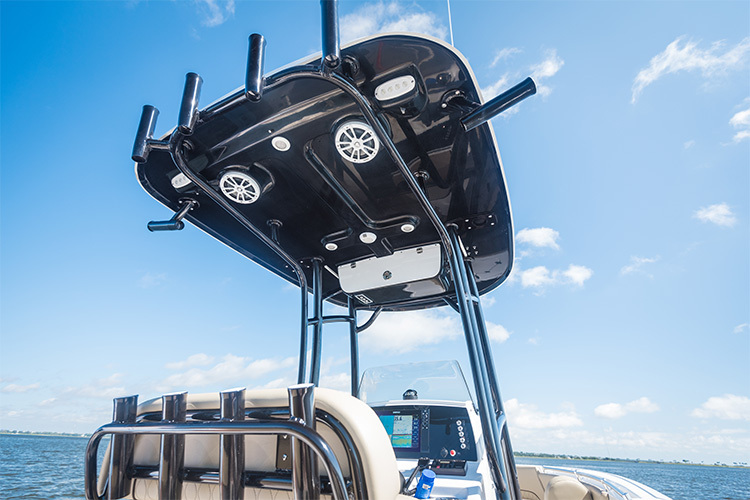 It is held in place using the included tracks under the hard-top and velcros to the bottom pipes of the frame. 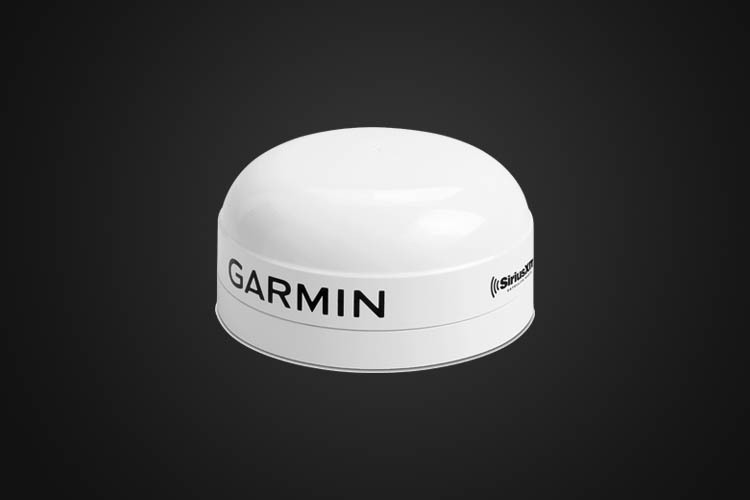 When not in use, there's virtually no sign of it left behind. 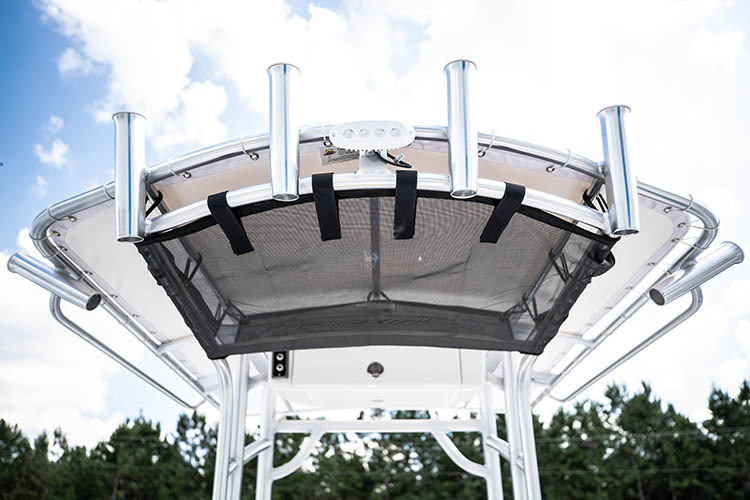 When equipped with the Deluxe Top, this cargo net bag adds space for storing life jackets. 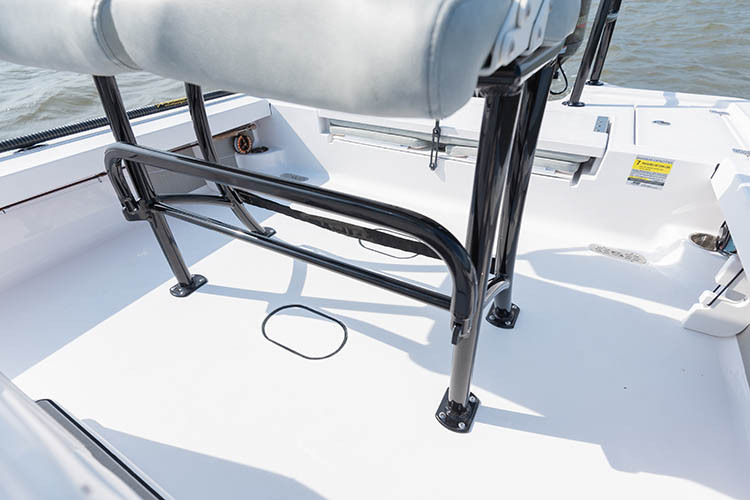 This compact unit adds some additional tackle storage under the leaning post seat. 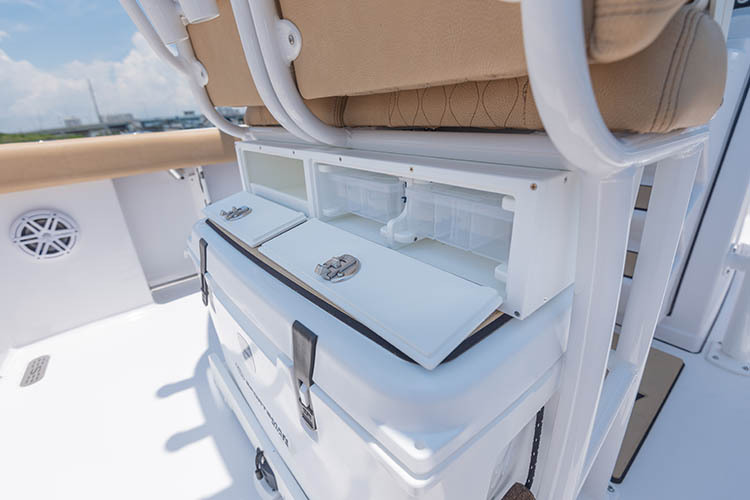 The drawers are lockable and include 2 plastic tackle organizer trays. 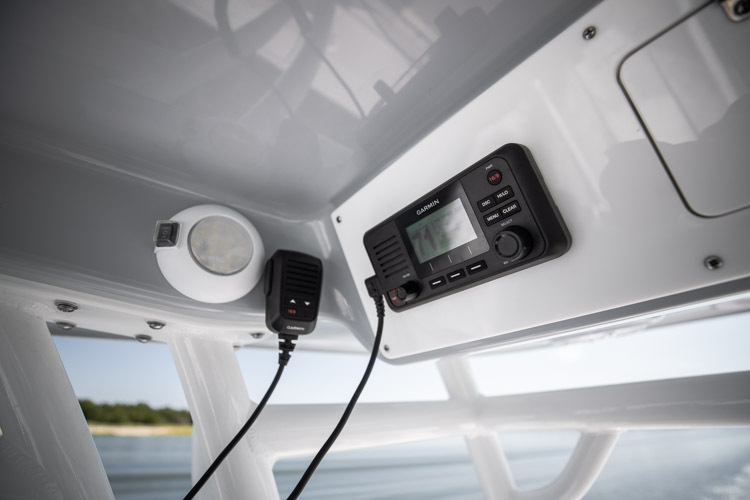 Built out of an anodized aluminum housing, these high quality LED underwater lights are a great feature for this model. 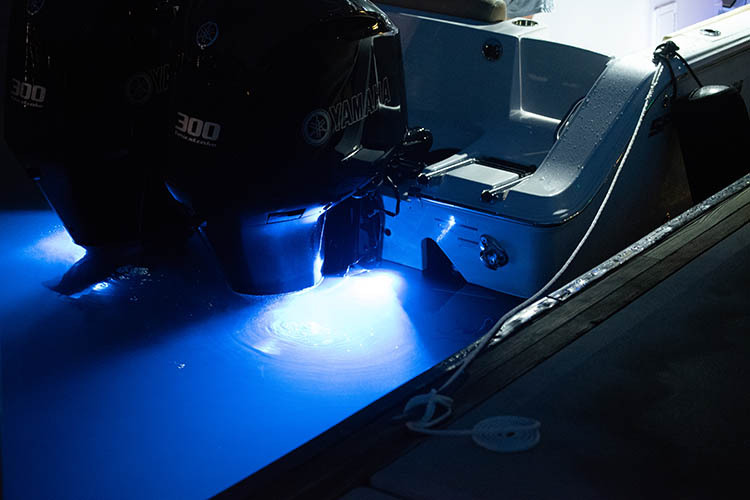 The Lumitec underwater lights have a measured output of nearly 900 lumens, giving you plenty of blue glow behind your Sportsman. 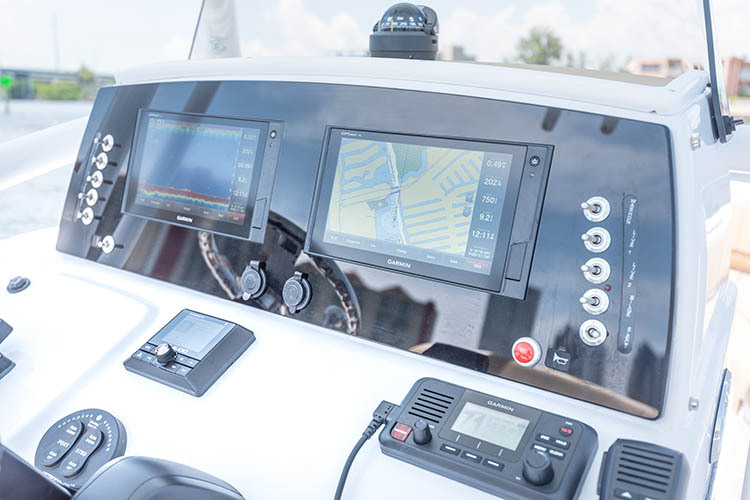 This boat comes equipped with 2 of them at the transom. 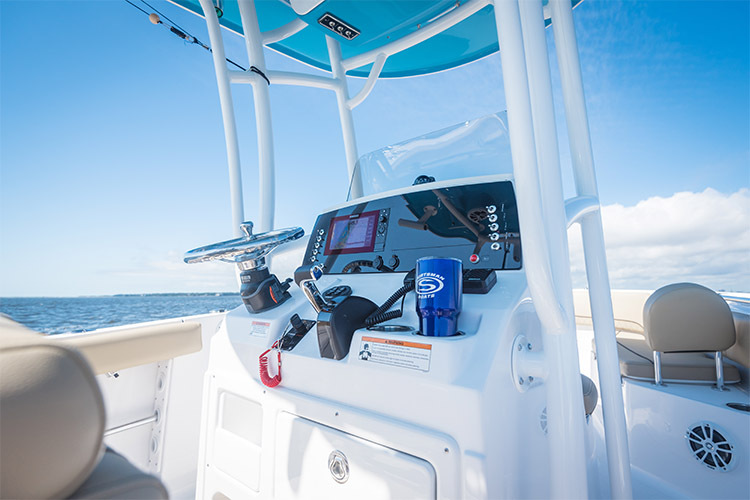 When choosing what options you would like on your Sportsman, we have put together several optional packages. 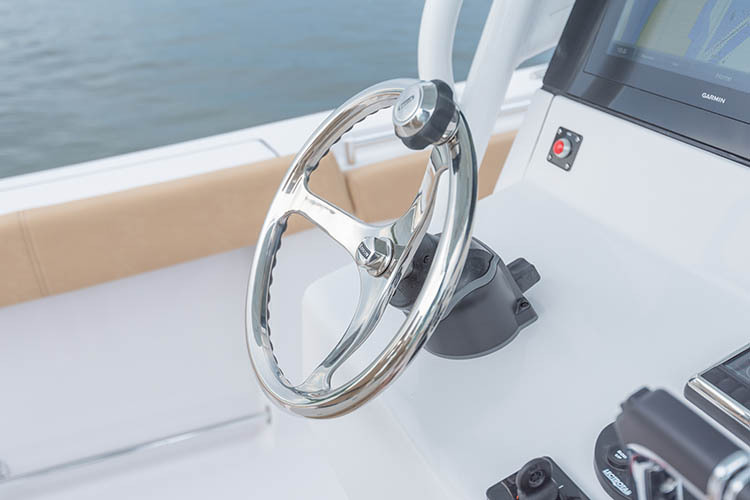 These packages are options that work well together and as experienced boaters ourselves, represent how we would option our boat. 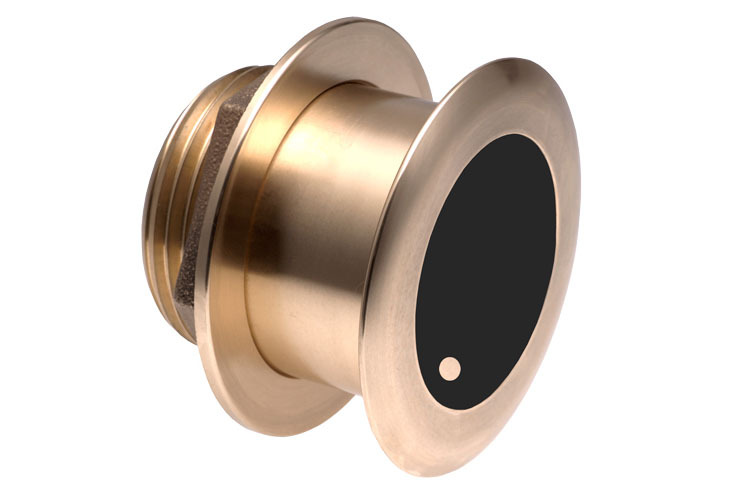 For those that would rather choose each option, we have all options available individually.